So after searching relentlessly, this finally caught my eye. Seems to be the most recent build. What do you guys think? Pretty snazzy if you ask me! 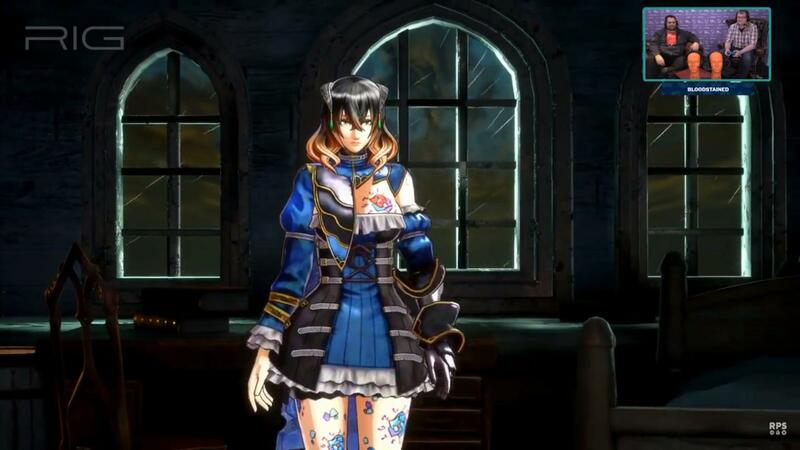 Bloodstained starts at 5:39:00.
its looking really good. i still think the minerva looks a bit empty and not very entertaining but the visuals look so much better. that 0 HP bug made me laugh hard tho. The one thing I can’t tell watching this off my phone is whether Miriam’s upgraded hair physics are implemented in this build. I don’t think so, but with the player jumping around like a grasshopper, it’s hard to tell on this tiny screen. it does move but its hard to notice, i had to watch carefully but i saw the movement. vepar looks incredibly challenging now and its definitely harder than the one in the previous demo and im very happy about that. maybe a little bit to hard for newcomers tho. immediate differences from the beta I was able to notice: the visuals have a massive improvement, especially with the lighting. at the start there's an option to choose difficulty, not sure if Hard/Nightmare were blocked off or not, was assuming Nightmare mode was something you had to unlock after you beat the game once, is that not the case? YouTube compression makes judging exact quality details hard but more larger scale things are noticeable. The lighting looks a lot better, mood lighting and glowy effects make things look pretty nice. The animations look better, certainly. 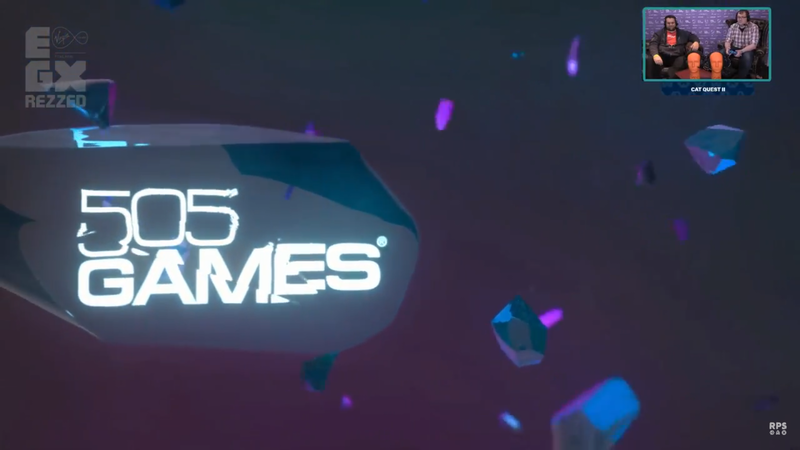 It's kind of funny how the guy talks about (some of) us doing exact, frame-by-frame analysis and comparisons about the backer demo and all the info we get our hands on, and here we are, discussing the very clip in exact detail. exile Hard to say if there's any hair physics in-game. They certainly animated during the cutscene, but I can't say if that was physics or preset. Just glanced through it. Looks fine overall, but I can see that some of the changes I'd hoped for didn't make it in. 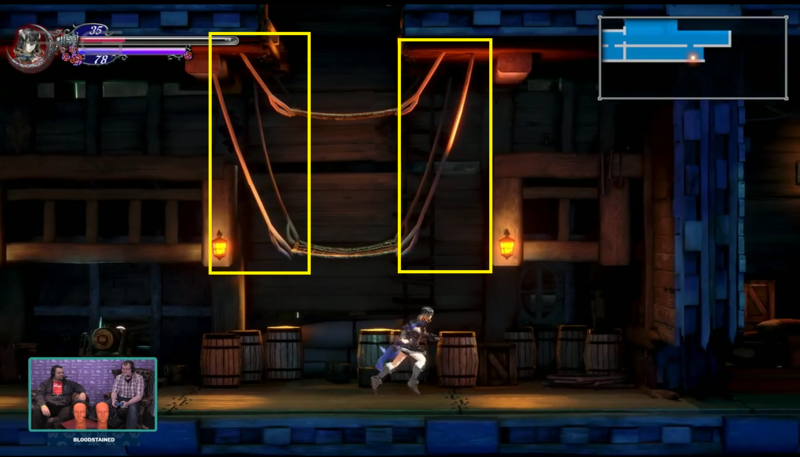 The save rooms are still castle-based on a ship, the hammock platforms don't have any give, there's no movement on any ropes (aside from lantern-based ones), and there's no pushing animation for the crate. All small things I can overlook, but some refinements would have been nice. I didn't watch all of it, so I don't know if the secret map room has been restored visually after taking a hit in the second backer demo. 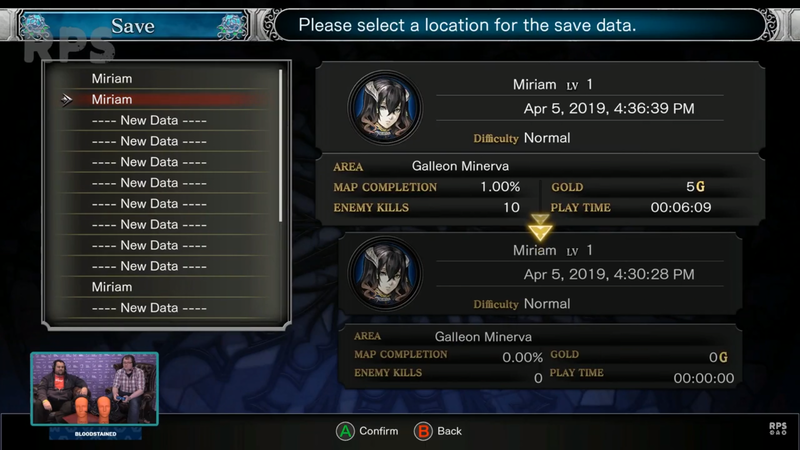 The Vepar battle does look improved from what I saw, though, and the weird shadow effects seem to be gone on Miriam, which is good if they couldn't be more consistently integrated. They FINALLY, FINALLY fixed the lightning! It took them TWO (maybe three) years, TONS of feedback and complaining of people pointing out how bad it was before, and calling in another team to help out, but it's FINALLY done! I may be sounding rude but I'm really glad they heard our feedback and did something about this whole ordeal. God bless WayForward! I'm really glad they found some really capable people to work on the project. It's a shame they probably don't have a lot of time to work on and the job that was done until now doesn't help, but what WayForward has done so far is amazing. 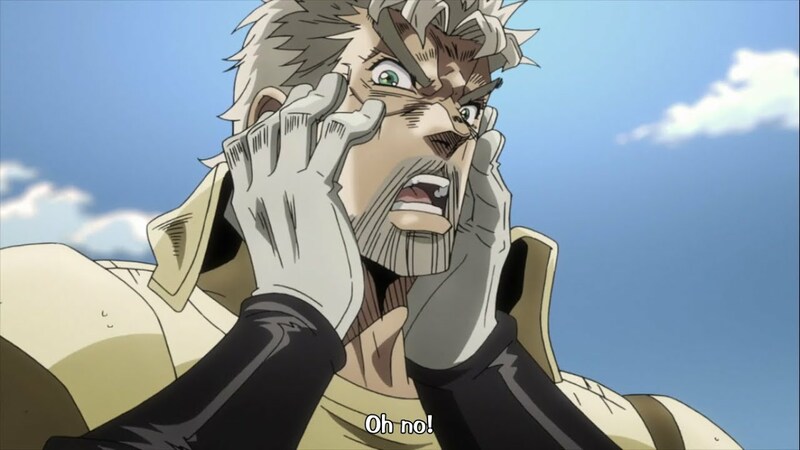 on further inspection and testing the beta with his level / gear the difficulty of the boss not only didn't go up compared to the beta as the boss deals the exact same damage and he has the exact same amount of max health, but the bosses difficulty actually went down as the fire shard he uses got a massive buff. 1) Accessory Ring is now "Rusted Ring". Conjure Shard Swing Tentacle is now "Thrashing Tentacle". 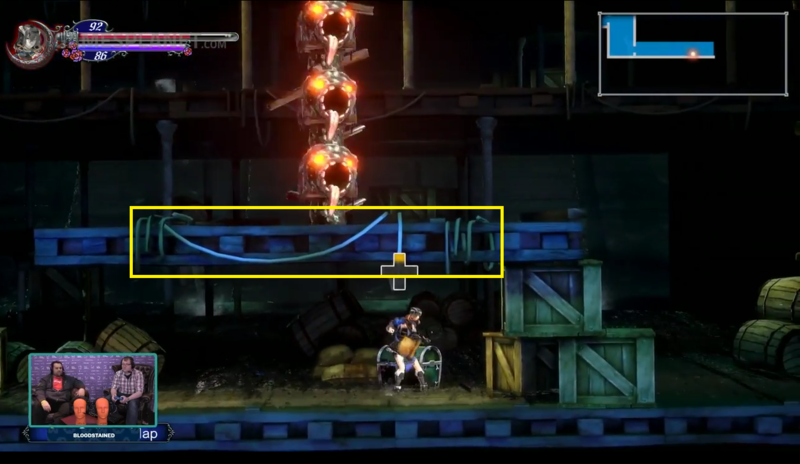 2) Overall animations, lightning and graphic were improved. Lip synch is definitely better. My only complaint is that Miriam eyes at the pause menu and at the dialogues looks a bit off, but that probably just me. 3) The game warns you about everything new you get, by adding information on your "Archives", something we couldn't see yet. It shows at the right bottom "Archives: Compendiun" Or "Archives: monsters" and such. 4) At the loading screen, you can read tips. I could see that amored enemies are resistant to slash attacks, but weaker to thunder and, i think, bashing. That reinforces what i said on some threads about Shortcut Sets that the game must give us enemies with different strenghts and weaknesses to justify us using different sets during gameplay and they are doing just that. It is also mentioned that visiting the shop may give you some hints about the game. 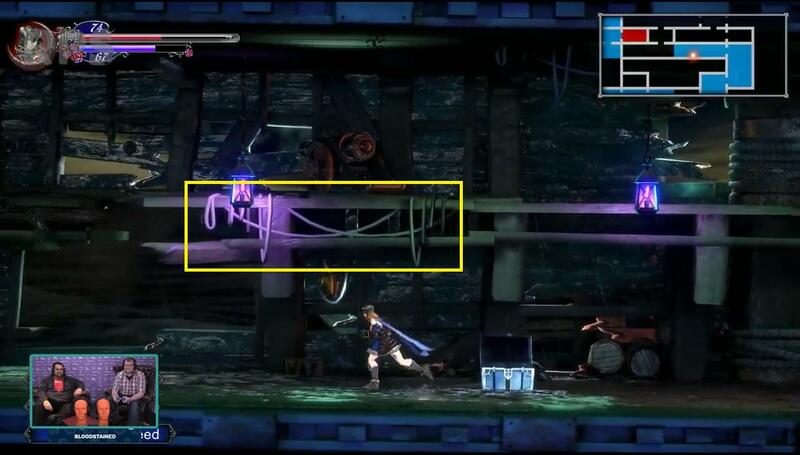 5) It was said that the saveroom actually has a lore behind it, and it will be explained in the game. 6) They also said that Miriam yellling changed due to people's complains. Apparently, she still painfully screams when she gets a new shard (because it is a painful process and impales her) but her yelling frequency when attacking was greatly reduced. 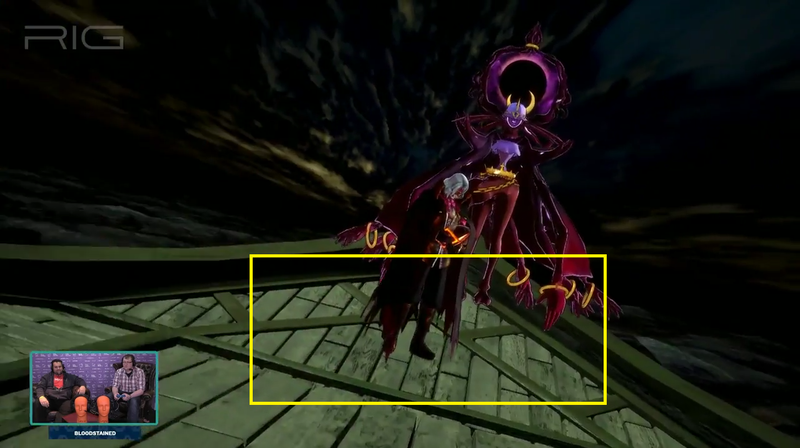 7) Apparently, some itens were moved around inside Galleon Minerva. I'm positive the game will not have any great changes after this. They are in the process of locking everything and just smashing bugs. What we are seeing is most probably what we will get. And that is MORE than enough for me. Great work guys. Definitely great work. Maybe add some shadows on the ground for key story segments like this one to make it look more appealing. Glad to see the improvements so far. Thanks to Angel-Corlux and Question for collecting and relaying the feedback to the development team to make this game look as good as possible. Nice effect on their logos. The reference to crystal and everything. 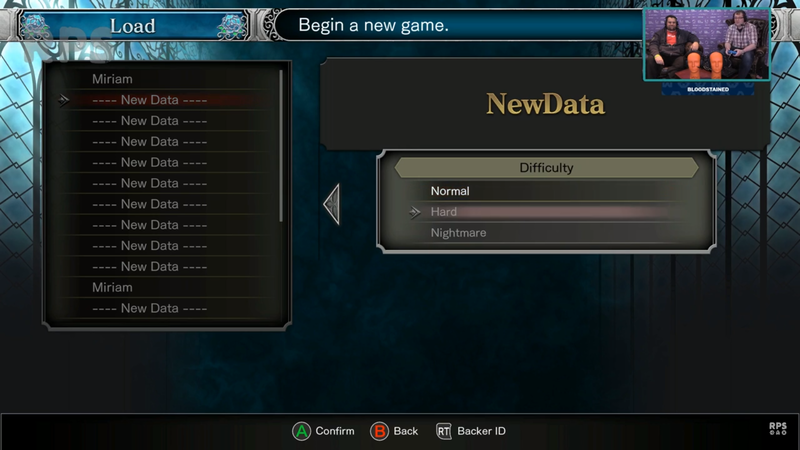 When you choose a save data, you can give it a name and also choose the game's difficulty, between NORMAL, HARD and NIGHTMARE. Both HARD and NIGHTMARE are locked, so, we can see that they are probably going to be unlocked only when you defeat the game. The loading screen has tips you can read (i collected all tips shown at this video, you can see them down below). 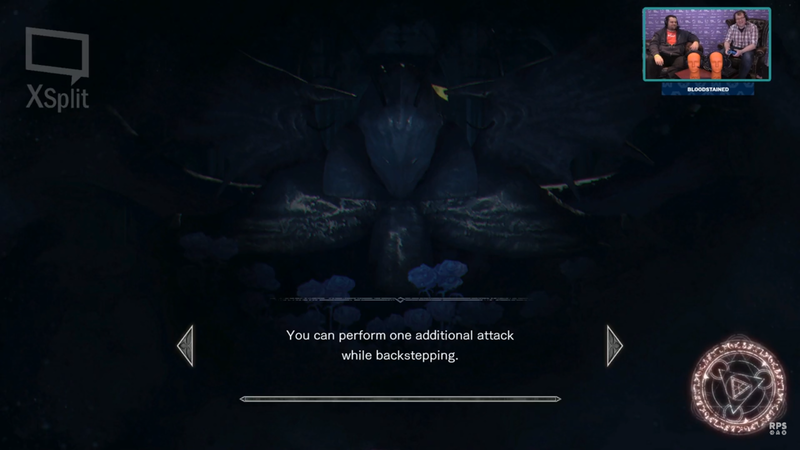 Also, the loading screen looks like that creature that you can see at the saveroom. Miriam looks better. Her graphics are more refined, you can see she has a small degree of expressions (she looks surprised, her eyes widen, when she sees Gebel and Gremory at the end). But we can tell, just like the old demos, that these graphics aren't made for expressions. Everytime they talk, their mouth is covered by something, because it isn't actually moving. That is not a problem, it was like that since the first demo, because, i believe, these models were made just for gameplay. Either way, She looks better. Miriam looks WAY MORE BADASS at the menu than it was before. Menu options, font and everything else was changed slightly. 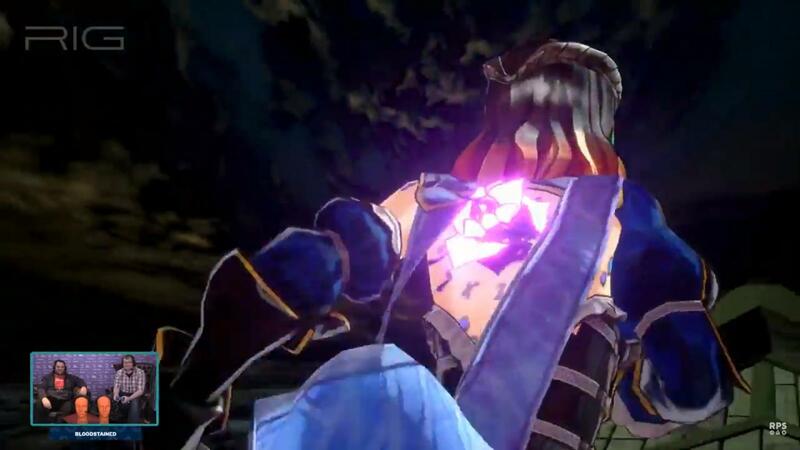 Also, we can see here, something i will address later, that Miriam's back has a crystalized rose. 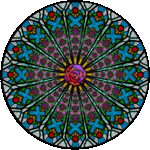 Such rose existed in 2016 Demo and was removed after it (turned into a tattoo like crystal), because it was clashing and clipping with her clothes and such. It seems they found a way to fix it because it is back now. Every single time you kill a new enemy, it shows at the bottom right "NEW! Archives:Demons". That confirms you actually start with a bestiary that is filled automatically when you kill a new demon. Archives also shows up at other moments, at scenes and even when she gets a Mana Rose (Archives: Compendiun) i'm trilled to know if such archives has some kind of lore or in-depth info. I really like that and i'm sure i will spend a lot of time reading such things. When the name of a new area shows up, you can hear a crystal shattering sound when it cracks. The saveroom looks way better. Some people criticized in the past, that the saveroom fits perfectly in the castle, but not at the Galleon Minerva and probably not at some other places. They said that the saveroom has a lore behind it that will be explained in-game, so, i'm sure they will address that somehow. When you save, you can actually choose a slot to save, you don't automatically overwrite it. i'm not certain, but it seems like the game has 21 save slots. These were the same number of slots of the 2018 demo. That's a lot of save slots and that's great, considering the game's length, multiple endings and playable characters. These shelves with books, when you use it, Miriam actually turns around and pick one to read. Cute little animation. 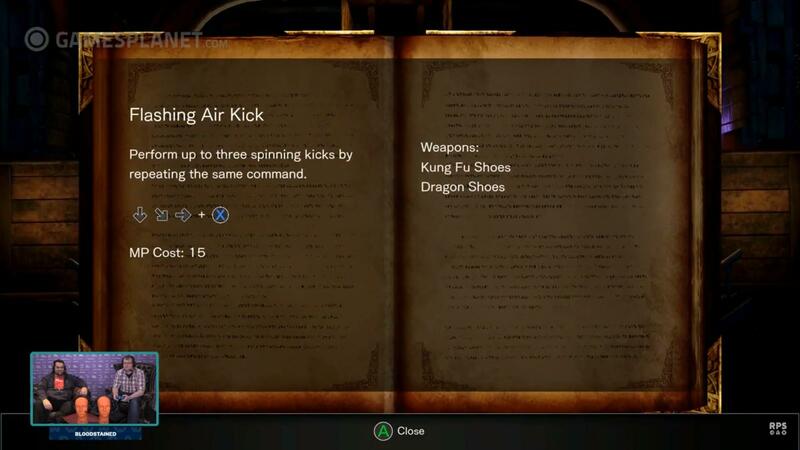 They said that the books will also talk about the game's lore and can even unlock certain skills. 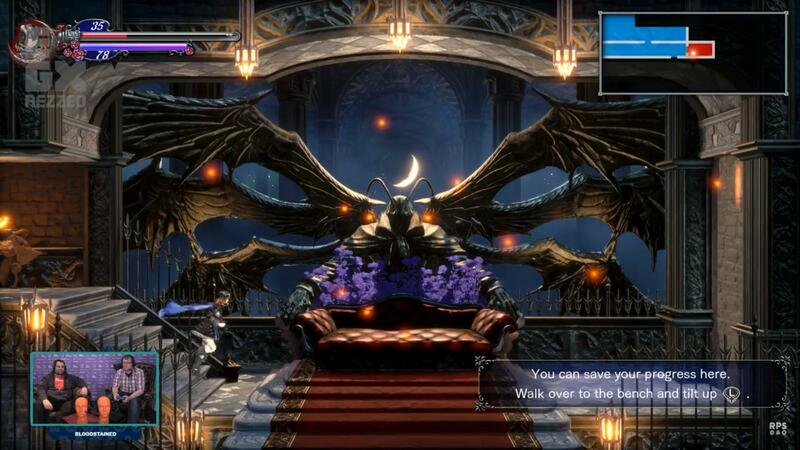 Gremory has a different pose than before. She is wrapped around her wings using her hands and looks even more evil. Funny what they talked about her: [Talking about Gremory] "She looks seriously bad news!" "Yes, she's...no fun"
Again, we can see her the crystal on Miriam's back, that existed before, was absent and now returned. The player was able to hit START at the last second when it was already dead and use up itens. When returned, Miriam died. That isn't something severe, but it is a bit weird, i don't know if that can be fixed. 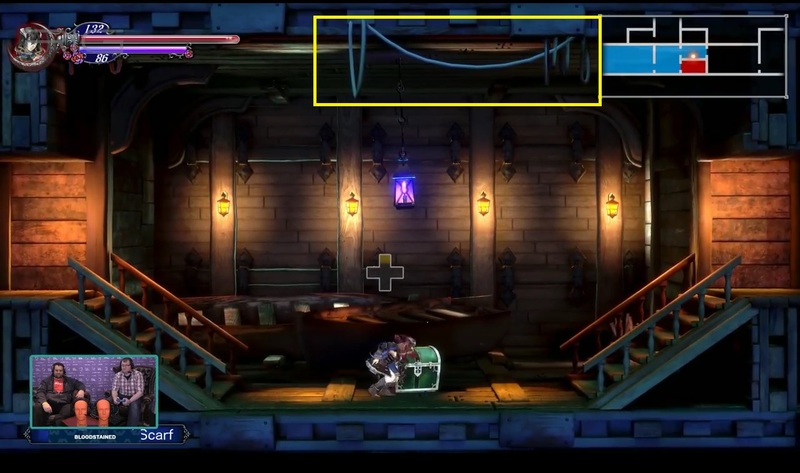 2) It was said that the magical door that you need to use your hand to open is there to teach the player that he can move Miriam's hand around, as a nod to the tutorial of Directional Shard that shows up later on, when you get Morte Cannon's Shard (that is mandatory). 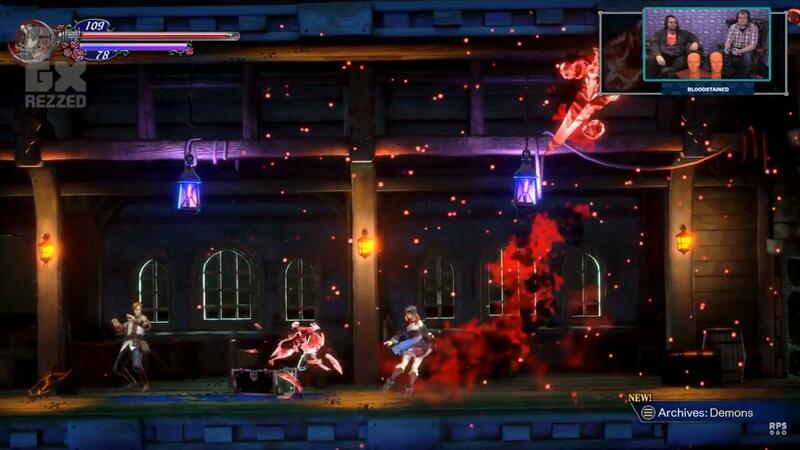 3) Enemies have different death animations, depending on how you kill them or explore their weaknesses. 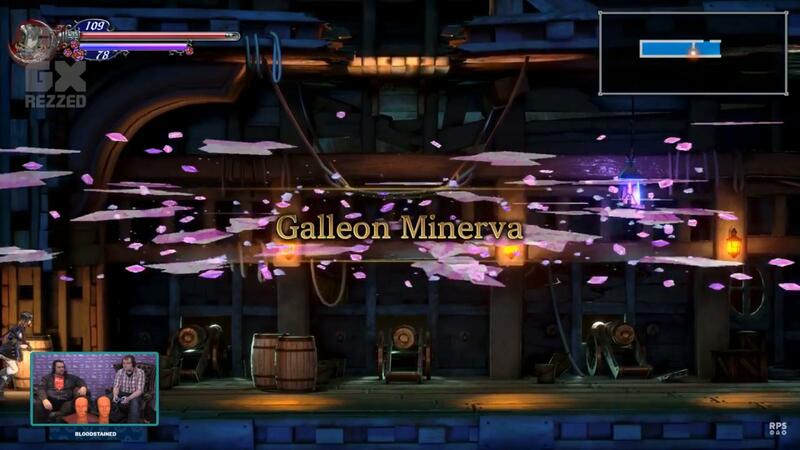 4) Galleon Minerva was built to be a tutorial-like level, to introduce the player to the basics of the game. 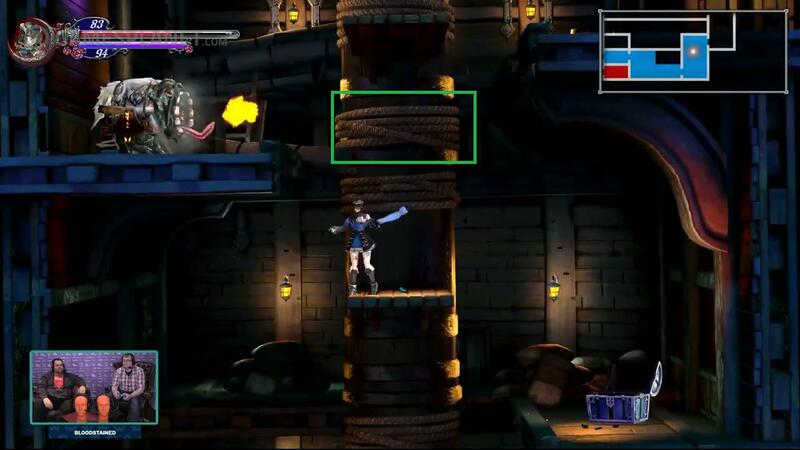 5) Bloodstained is more open-ended. If you are skilled, you can, technically, go to certain places you "shouldn't" go, and it is highly dependant on your playing skills, because you can be one-shot by enemies if you go to these places ahead of time. 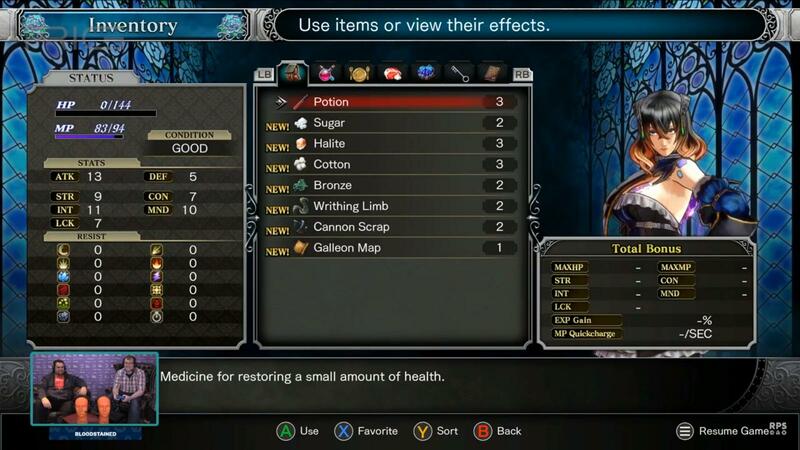 6) It seems Blue chests give alchemy itens while Green chests gives weapons and gears. Wooden chests give consumable itens. 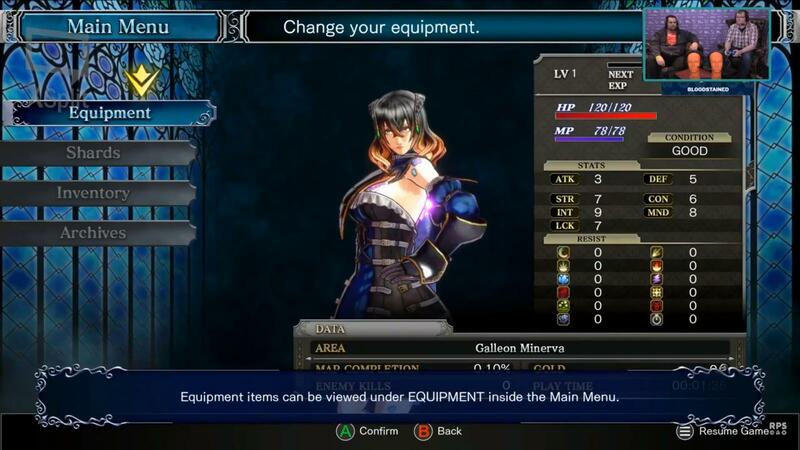 Some abilities of Miriam was designed to address some criticism about her being slow. Abilities that allow her to move super fast. 7) You can hear that song when you reach Arvantville for the first time, playing in the background after Vepar is defeated. This build was probably bigger or is even the full game. 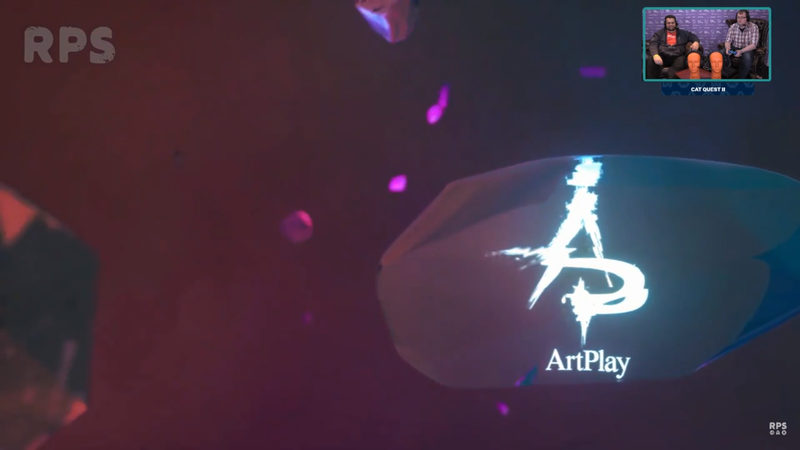 8) They are just about to reveal the game's launch date. Sometimes, when you visit the shop, you will receive hints about how to proceed. The "slow" condition temporarily causes all your movement to slow down. Armored foes are usually resistant to slash attacks but weak against striking attacks and thunder. You can continue firing after running out of ammo, but you will be switched to weaker bullets. STR affects your physical attack power, while INT influences magical attack power. Pure Miriam Great analysis as always. Without knowing the codebase, exact answers are impossible, but that looks like a rather standard race condition. There's probably a window of time between the game noticing that Miriam's HP has hit zero and then locking out all the game inputs. It might even be frame perfect stuff, if the update loop checks for Miriam's death before input checks but only locks those inputs after their checks. I'd be surprised if it isn't fixable, but the devs might have more pressing issues to deal with. Very nice, I am super happy with everything now. 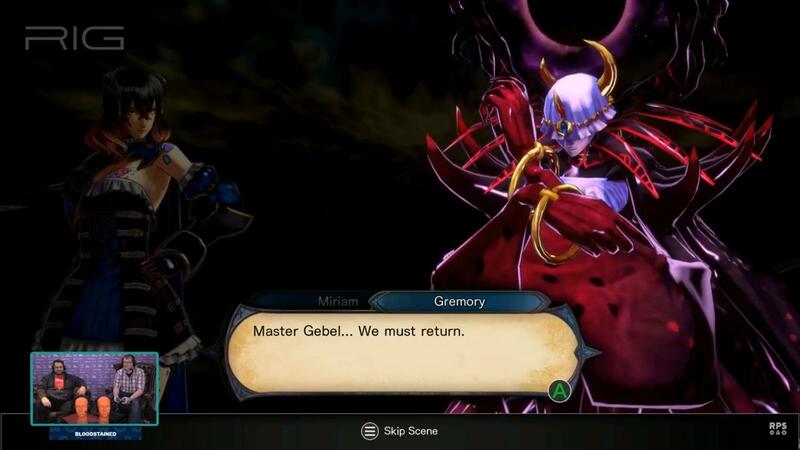 The cutscene with Miriam and Gebel was superb! I like how Miriam gasped a little and her eyes widened. Like one of you said though, some stuff need shading to increase dramatic effect in cutscenes. Lepstadder Well, I mean, Miriam herself already has some expressive JoJo poses. 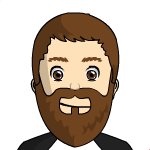 Okay, now that I got to a proper computer, I definitely notice the hair is NOT moving earlier in the video, but somewhere along the way, it becomes animated and starts moving. Am I crazy? Does anyone else see this? Compare 5:46:00 to 5:50:50 for an example. exile thanks for posting this, I should have myself and it slipped my mind. Can you change the thread title to "Newest build footage shown at EGX London" so it's clear there's something new to see for those not in the know? "Latest demo" could be ignored by people thinking you're talking about the 2018 demo. You got it! Yeah, I could’ve been clearer.